Greg Joswiak, Vice President of iPod and iPhone Product Marketing for Apple, is confident that gaming is at the centre of Apple's future successes and that the iPod is a better gaming device than Nintendo's DS or Sony's PSP. In a recent interview with T3, Joswiak informed them: "The quarter that closed September was the biggest iPod non-holiday quarter ever. "So iPods did extremely well. Certainly a big part of that success was the launch of the September products," adding, "I think where we surprised a lot of people is with the success of the iPod touch." "Where we're getting the benefit is with the apps store. The apps store really changed the dynamics in a big way for the iPod touch because, you know, in over 100 days we've had over 6,000 applications, with over 200 million downloads. So there are 6,000 more reasons to buy an iPhone or an iPod touch. Games are central to the success of the iPhone and iPod touch, in Joswiak's opinion, as he tells T3.com: "The biggest category of all in the apps store has been games. There are over 1,500 games and there's a great affinity between the iPod touch customer and those games. "And that's part of our positioning of it as the funnest iPod ever – you've got your music, your video, and your games." iPod gaming is not merely about 'casual' games, as Joswiak opines: "The gameplay I think has surprised a lot of people, because it's not just the casual games. There are real 3D games, and it's hard to imagine we're only a little over 100 days into it. There are already so many games and as we look at it, to us it really seems this is the future of gameplay. "Whereas a lot of these devices [picks up Nintendo DS and Sony PSP] are more in the past. And a big part of that is not just the device itself, which is easier to carry, and has the touch display and accelerometer which is great for gameplay, but it's the electronic distribution of the apps as well." "That changes everything," says Joswiak. "Whereas apps on other devices have to be delivered primarily physically, they cost a lot more, £25 versus £5. We don't have to worry about licensing and manufacturing hardware, we don't have to worry about forecasting, returns, missing the forecast, what happens if there's a problem with the product, you have the full back inventory here... it also gives the developer the ability to update." As to the future of gaming on Apple's devices, Joswiak states: "On the store you see everything from the casual games, there's no doubt there are a lot of casual games, to the 3D-oriented games, action games, and the amazing thing is…. if you squint your eyes you can see a future where it's amazing the things you'll see as far as gameplay, and we know from working with these developers and the things they tell us they're working on, especially original content ideas, I think they're going to blow everyone away. "Because again the computer power and the 3D graphic power here [picks up iPod touch] is significantly greater than what you have here [picks up Nintendo DS]. So this allows people to do significantly higher quality games. 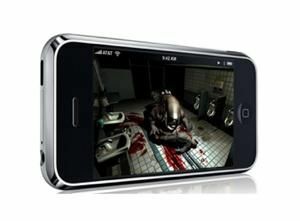 And the iPod touch is always in your pocket, whereas you can't always carry some other games consoles."